The Superintendent displaying an alert in multiple languages. Humans have a plethora of languages that they use to communicate with one another. As a space-faring race, humanity spread many of their native Earth languages as they settled on numerous colonies. By the 26th century, the English language served as the primary language of the Unified Earth Government and, by extension, the United Nations Space Command. Although English is spoken widely across Human-controlled space, several other human languages are still used, mostly with secondary roles in society, as English is often found in conjuncture with them. During the Human-Covenant War, some members of the Covenant studied and learned one or more human languages in order to interpret human communications. The Royal VISR for MJOLNIR [GEN2] features a translation system and local database of hundreds of human languages, many of which are now thought extinct after the Covenant War. A citizen alert in downtown New Mombasa, written in English. English is a West Germanic language originating in England and the first language for most people in Australia, Canada, Ireland, New Zealand, the United Kingdom, and the United States of America—together, commonly known as the Anglosphere. This language has grown to prominence as the dominant language of the Unified Earth Government and the human species, and is the primary language of every known human colony and organization. Covenant translation software intercepted human COM transmissions after the First Battle of Harvest, and thus the Covenant learned English quickly. Following first contact at Harvest, the High Prophet of Tolerance had five hundred teams of well-educated Sangheili and Unggoy formed to study and translate English. These teams could only speak English among themselves and were later required to teach it to all Covenant military units. From 2525 to 2552, the Covenant used this knowledge mainly to broadcast florid curses at human colonies and ships before destroying them, and never actually held conversation with humans. Several other species had the ability to speak English, including the San'Shyuum and Unggoy, a fact the latter take great pride in. Kig-Yar could speak English in a rasped manner, though most are unable to form a proper "f" sound in speech. Most Sangheili could speak English, although they had difficulty pronouncing words containing the letter "v" or ending with "p". 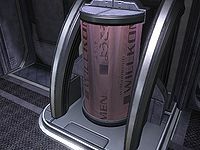 UNSC translation software has been able to decrypt a number of Covenant languages, most notably those of the Unggoy, Kig-Yar, Sangheili, Jiralhanae, and San'Shyuum. By the time of the Battle of Earth, this software could automatically interpret anything that most of the races said, and has apparently been installed in the equipment of all UNSC military personnel, as all personnel appear to have the ability to understand what members of these races are saying. However, by 2552, the Yanme'e language was still largely untranslated. 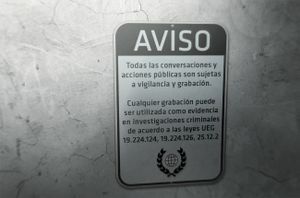 A UEG notice sign written in Spanish. Spanish is a secondary language of the UEG and, by extension, the United Nations Space Command. Having its roots in Latin, Spanish bears many similarities to English and is used in various places throughout the UNSC, but has seen diminishing use due to the UEG-wide adoption of English as its primary language. Spanish is spoken mostly in areas where it saw prominence in earlier eras, such as Latin America and Cuba. Most of the population of Madrigal was of Hispanic ancestry and thus spoke Spanish fluently. After the planet was glassed by the Covenant, the survivors established the Rubble, a self-sufficient community in the asteroids surrounding the nearby gas giant Hesiod; most on the habitats of the Rubble had Hispanic names. Spanish was also spoken on the colony planet Verge, as evidenced by the name name of the city Ciudad de Arias and by signs in the city's subway tunnels. Many members of the UNSC Marine Corps speak Spanish, including Corporal Perez and the deceased Private Manuel Mendoza. The Chinese language comprises a variety of different dialects spoken in various provinces of China. Standard Chinese, commonly known as Mandarin, is spoken in most of northern China and part of western China. Earth-born freshman Cadet Junjie Chen regularly video-conversed with his father in Mandarin about his progress at Corbulo Academy. Other major Chinese dialects include Wu and Cantonese. Cantonese is primarily spoken down south in China's Guangdong Province and in Hong Kong. Being half-Chinese on her mother's side, Sergeant Lian Devereaux is at least partially fluent in her mother's native tongue, as evidenced by her habit of swearing in Cantonese. India is home to several hundred languages spoken by different ethnic and religious groups. The most commonly spoken and most well-known language in India is Hindi. Hindi continues to be spoken and is used in some Andesian cities like Promesa. Sanskrit is an ancient Indian language. It is the sacred language of Hinduism and Buddhism. Dr. Catherine Halsey is knowledgeable in Sanskrit scripts, having read the Hindu holy book Rigveda and written some of its verses into her diary. Portuguese originates from the southern European country of Portugal. It is Earth's second most spoken romance language after Spanish and is spoken in parts of South America, Africa and Asia. The Portuguese language continues to be spoken by some humans in the 26th century. The Russian language is primarily spoken in the nation of Russia. The language continues to be used throughout the country's cities like in Tyumen. Originating from Russia, Corporal Vasily Beloi spoke his native land's tongue. A holographic sign on the Quito Space Tether, with "welcome" written in both German and in Japanese. German is a language spoken by a number of humans, originating from the country of Germany in Europe on Earth. The German language was spoken by the Unified German Republic, the Federal Republic of Germany and the Frieden rebel forces during the Interplanetary War, and continues to be spoken by some humans in the 26th century despite the adoption of English as the lingua franca of the UEG. NuNordic is a language spoken in the twenty-sixth century that is a relatively new derivation or amalgamation of the North Germanic languages. It is most notably the principal language on Losing Hand. The Japanese language is spoken in the archipelago nation of Japan. It continues to be spoken in the 26th century. Lieutenant Aki Hikowa, who was of Japanese ancestry, could speak the Japanese tongue. French is a language primarily spoken in the European nation of France, but is also spoken in other regions around Earth. Like Spanish and Portuguese, French is also a romance language that descended from Latin. Due to French and Belgian colonialism from the 17th and 18th century onward, the French language was introduced to various parts of Africa. In many parts of the African continent, the French language is often spoken mixed in with regional indigenous languages. By the 26th century, a dialect of African French was spoken locally by some vendors in the older sector of Mombasa in Kenya. Because most of the first colonists who settled on the planet-moon Meridian came from France, some of the world's locales had French names. Hungarian is a Uralic language in the Ugric language group. It is spoken in Hungary and countries with large Hungarian minorities. Because a number of its original settlers were Eastern European in origin, Hungarian is a common language on Reach and many of the regions on the planet have Hungarian names. Being a native of the planet, Jorge-052 spoke Hungarian, and it may have been his native language. The ODST Tarkov was also a native Hungarian speaker and his unit appeared to be composed mostly of Hungarian speakers. 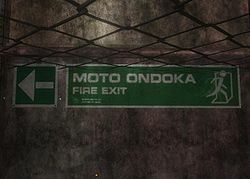 A sign in Traxus Factory Complex 09, with "fire exit" spelled out in Swahili and English. Swahili (also called Kiswahili) is a Bantu language widely spoken in East Africa, Earth. Swahili is the mother tongue of the Swahili people who inhabit a 1,500 kilometers (931.5 miles) stretch of the East African coast from southern Somalia to northern Mozambique. As of the early 21st century, it was spoken by over 50 million people, of whom there were approximately five million first-language speakers and thirty to fifty million second-language speakers. Swahili has become a lingua franca for East Africa and surrounding areas. Although Swahili has somewhat diminished due to the adoption of English as the primary language of the UEG, it is still widely spoken in its native areas around the modern East African Protectorate. Swahili was utilized extensively in Kenya, as evidenced by a number of intercom announcements in Mombasa and signs around the town of Voi. Latin is an ancient Indo-European language originally spoken in Latium, the region surrounding Rome. It gained wide currency, especially in Europe, as the formal language of the Roman Republic and Roman Empire and, after Rome's conversion to the Christian church, (and later to Catholicism after the "great schism") of the Roman Catholic Church. Principally through the influence of the Church, it became the language of later medieval European scholars and philosophers. It widely influenced a number of languages that came after it, including some used by the modern UNSC, such as Spanish and English. By 26th century, Latin had become extinct from everyday usage. Onyx Sentinels were capable of attenuating their communication systems to produce COM signals on UNSC devices and use Latin phrases. After one of the Sentinels approached Ash-G099, informing him of the status of the "Shield" and demanding the "Reclaimer" to provide a proper counter-response, it referred to Ash's confused reply as a "non sequitur" (Latin for "it does not follow"). In addition, they are capable of modifying their lexicon based on samples of human language and speaking fluent English. Some UNSC ships follow the tradition of older Earth vessels by putting Latin phrases on their ship emblems. The UNSC Marine Corps carries the tradition of the ancient United States Marine Corps by using the motto "Semper Fidelis", which is Latin for "Always Faithful". The Office of Naval Intelligence also uses a variant of this term for their own emblem, "Semper Vigilans" ("Always Vigilant"). Unggoy, Sangheili, Kig-Yar, Jiralhanae, and San'Shyuum can be heard speaking English in Halo 2, Halo 3, Halo 3: ODST and Halo 5: Guardians due to UNSC translation software. The Halo Waypoint administrator Catalog (posting in-character as the Juridical agent of the same name) makes frequent use of Latin terms and phrases in its posts, echoing the Onyx Sentinels' use of the root language. These items are shown in brackets, much like certain ambiguous terms in the Halo 3 terminals and the Bestiarum.